It would be great for us. It means a lot to me. A lot of people doubted I could do it. 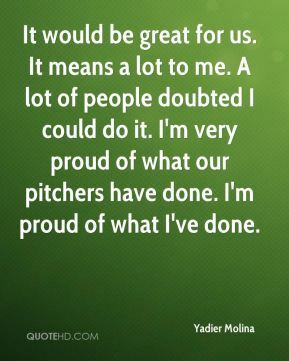 I'm very proud of what our pitchers have done. I'm proud of what I've done. It was not one of his best games. But, with that, we have to give credit to the other team, too. They came in hacking. They came in swinging. 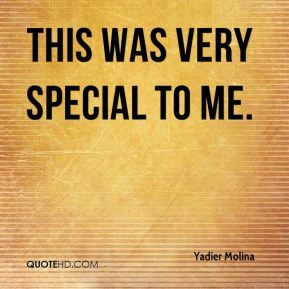 This was very special to me. I feel good catching and that's what I want, ... 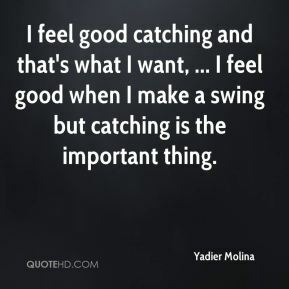 I feel good when I make a swing but catching is the important thing. 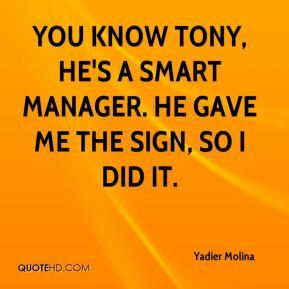 You know Tony, he's a smart manager. He gave me the sign, so I did it. 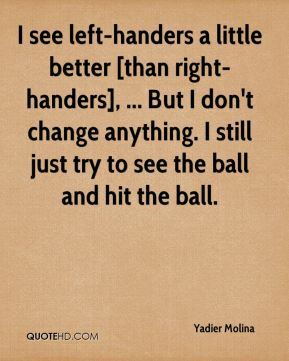 I see left-handers a little better [than right-handers], ... But I don't change anything. I still just try to see the ball and hit the ball. Two or three more days and I'll be back. I feel good. I made some strong swings. No pain, no pain at all. I was in good position, so he could slide, but he came after me. I know him. I always keep the guy in my mind. ... He had plenty of room to slide, but he didn't. It's OK with me. 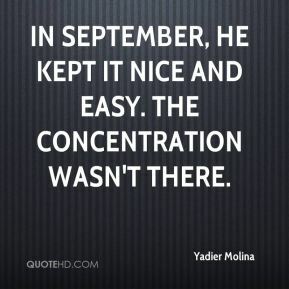 In September, he kept it nice and easy. The concentration wasn't there. 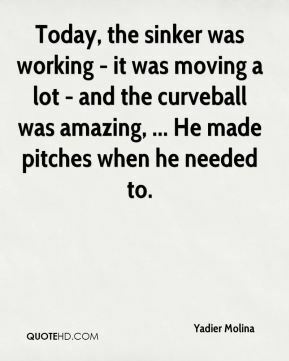 Today, the sinker was working - it was moving a lot - and the curveball was amazing, ... He made pitches when he needed to. It's hard for them and it's hard for me because I got pitchers who I don't know about. But it's hard for me to say no to my country, and they understand that. 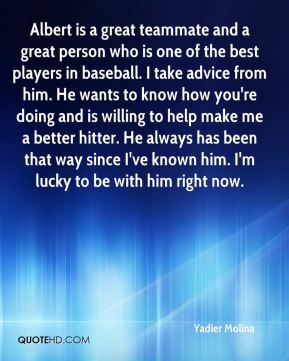 Albert is a great teammate and a great person who is one of the best players in baseball. I take advice from him. He wants to know how you're doing and is willing to help make me a better hitter. He always has been that way since I've known him. I'm lucky to be with him right now. 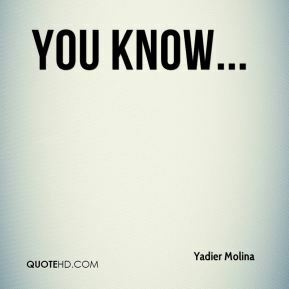 He knows about baseball. 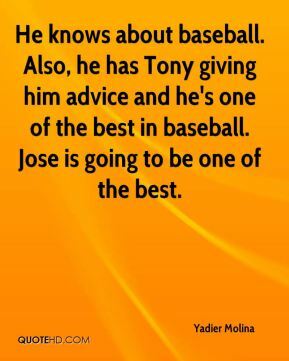 Also, he has Tony giving him advice and he's one of the best in baseball. Jose is going to be one of the best. 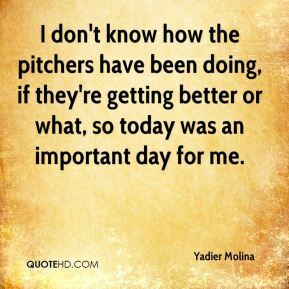 I don't know how the pitchers have been doing, if they're getting better or what, so today was an important day for me. It was a dream come true for me to play with him. It feels good. I'm happy to be back. 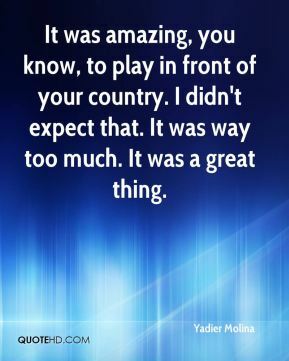 It was amazing, you know, to play in front of your country. I didn't expect that. It was way too much. It was a great thing. I didn't expect it, but I'm ready for it. 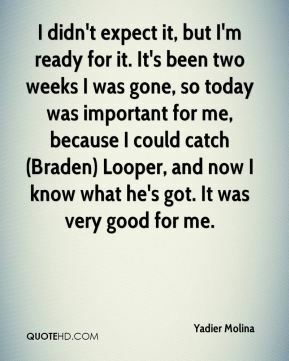 It's been two weeks I was gone, so today was important for me, because I could catch (Braden) Looper, and now I know what he's got. It was very good for me. It was unbelievable. It was like playing in the World Series. That surprised me. Who knew that many people live in Puerto Rico? 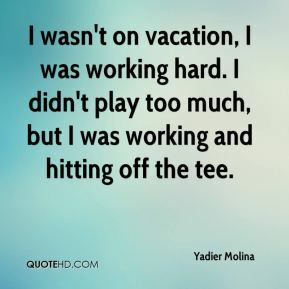 I wasn't on vacation, I was working hard. I didn't play too much, but I was working and hitting off the tee. There's not much room there. But we'll see how that (plays). 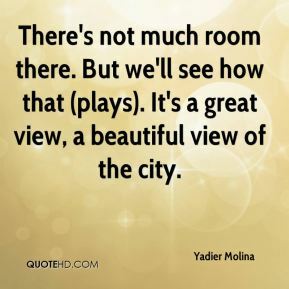 It's a great view, a beautiful view of the city. I think we can. 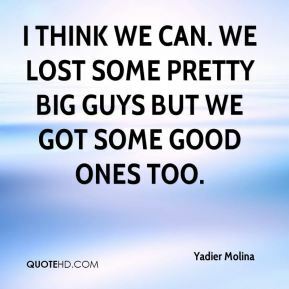 We lost some pretty big guys but we got some good ones too. 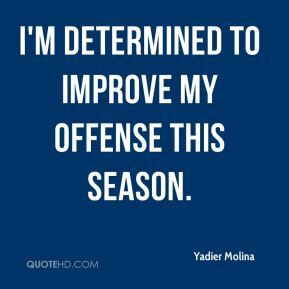 I'm determined to improve my offense this season.